For more than 110 years, Hansgrohe has embodied cutting-edge technology, emotive design and high-quality workmanship in mixers for bathrooms and kitchens. Made in Germany, Hansgrohe’s award-winning products have evolved through a love of water, innovation and an ongoing responsibility to the environment, and the community. 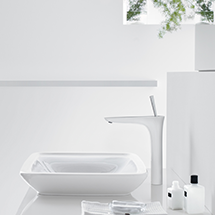 Whatever aspirations you have for your bathroom, be inspired by Hansgrohe’s product range. Whether you’re looking for high-quality mixers for your wash basin or bath tub, a new tap for your kitchen, or an elegant showerhead, Hansgrohe has the answer. You will put together stylish combinations with confidence, without any fear of committing any faux pas.